Well, OK, maybe it’s only 95% complete. But now is a really good time for me to write a blog. The first obvious difference is the size. The new armature is about 9 inches tall and towers over the last armature. I used the same brass bar to build the joints in each, and on the new puppet, they don’t appear so bulky by comparison to the limbs and body. Another notable difference is the type of joints I made. 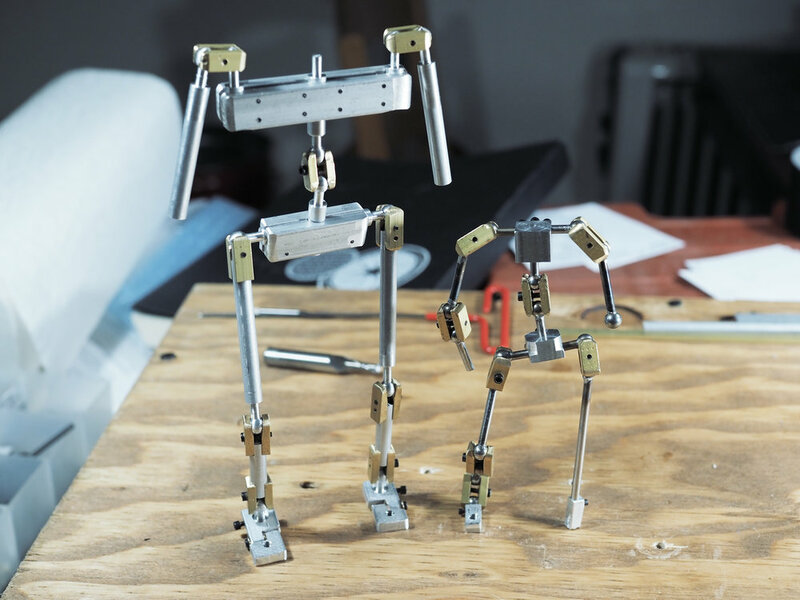 The new armature uses three double-ball joints (as used previously), and a new single ball design for the other six joints. These single-ball joints are much more intuitive. Everything seems to move more naturally. There’s no confusion as to where the motion should be generated. I thought the double-ball design would make sense for the shoulders, but I think I might even change those for next time. Finally, the metals I used are different. I stopped using steel. Instead, I used 1/4” aluminum rods to make the limbs. I also sculpted the balls on the ends of these rods, skipping the ball drilling and soldering process altogether. I had to buy a special tool to do that, but it was worth it. The aluminum is so light and easy to work with. I’m a little worried that it won’t hold tension as well as steel, but so far it seems to work great. The design I worked from was for a big, broad-shouldered character. I built out the torso and hips to reflect that. I am looking forward to skinning this armature, crossing my fingers that it will stand up to more weight. Sign up for the workshop is now open! have a chance to connect with other like-minded creators. This workshop is the last phase of the grant project, and it will not only serve as an opportunity to show my work, but to help measure the community’s interest in future stop-motion related activity and programming. If this might interest you or someone you know, please don’t hesitate to touch base with me at hello@adamloomis.com.